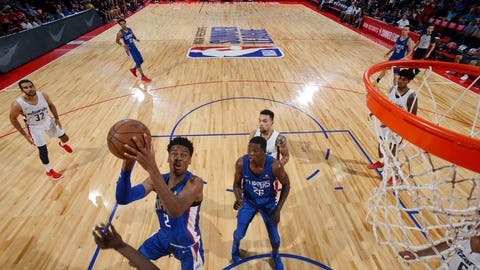 As the Los Angeles Clippers quest for a Summer League title comes to an end courtesy of a 97-81 defeat at the hands of the Atlanta Hawks, much is to be learned from the six exhibition games. First and foremost, Clippers fans should be wildly excited to see Shai Gilgeous-Alexander take the court at the Staples Center. Despite sitting out the last two games, the former Kentucky Wildcat proved his worth as the No. 11 overall pick in the draft. Not only did he tally team-high points, he routinely demonstrated an ability to operate the offensive efficiently. The 6-foot-6 guard created his own space and involved teammates off the dribble and in pick-and-roll situations. Gilgeous-Alexander also turned heads on the defensive side of the ball, jumping into passing lanes and being an active pest to opposing ball handlers. Following in his fellow lottery pick teammate’s footsteps was Jerome Robinson, the No. 13 overall selection in the draft. Robinson was not as prolific on the stat sheet, but certainly exhibited traits sought for from a top choice. Often giving way to SGA in terms of commanding the offense, Robinson settled for catch-and-shoot situations and allowed the game to come to him. As a 6-foot-5 option, he exuded the confidence that allowed him to be second in the ACC in scoring last season and appeared to grow immensely from the exhibitions. As far as returners, it was clear Sindarius Thornwell had a year of NBA experience under his belt. Built to play at an elevated speed and a more aggressive level, Sin City stayed true to his name. Thornwell was active on both sides, driving at will and posing a threat to any perspective shooter who eyed him up. While it is difficult to extrapolate much other than valuable experience out of Summer League action, Thornwell proved he has improved and will play a valuable role for the Clips. 📊 17p/4r/2a/1s/2b | @Sin_City_803's top plays from last night against the Lakers. The Vegas session came to a close with all three of these players taking DNPs, but the guys on the court made sure to put on a show fitting for the Strip. Both Jaylen Johnson and Thomas Wimbush unleashed rim-rattling dunks, while a thrilling transition attack got the scoring rolling early. The Clippers wrapped up Summer League with a 2-4 record.